Thank you for becoming part of our Capital Campaign! 2019 marks our 46th Anniversary as a leading arts organization in Los Angeles. We could not have done it without the generous support of our community and donors like you. Your belief and support of our work helps us keep the doors open and has propelled us into this a new phase with the purchase of our property. 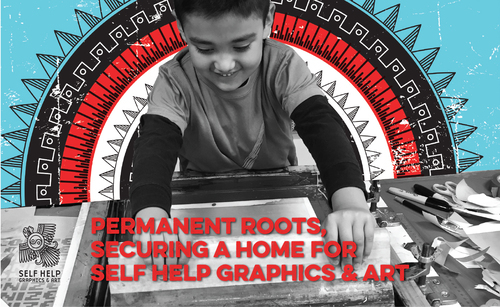 Your donation will support the renovation of our building and expansion of our programming to better support local artists, youth and diverse communities through creative expression. Thank you for joining our Capital Campaign and celebrating this milestone with us! Would you like your donation to honor or commemorate someone? Why is Self Help Graphics important to you? Tell us your story. Thank you for joining our Capital Campaign. Your generosity and support is crucial to the work that we do. Together we can advance Latinx arts and culture.